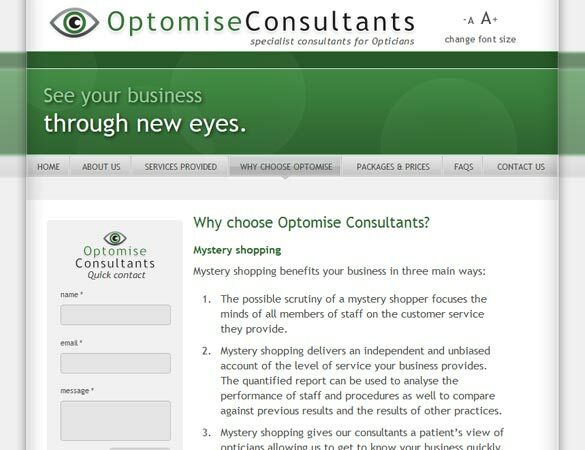 Optomise Consultants provide mystery shopping services and business improvement consultancy for Opticians. In consideration of this relatively unique and targeted offering the homepage provides a jargon free introduction to the services along with two clear calls to action offering users requiring a more detailed overview. 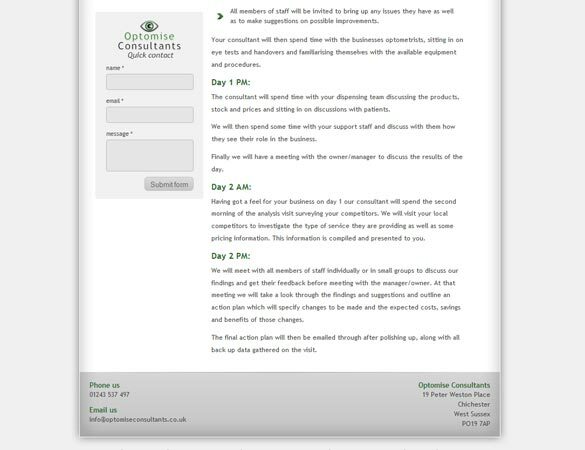 Given the specialised and tailored nature of the services offered by Optoimise Consultants the company is keen to engage with their clients and encourage enquiries. The dynamic contact form in the left-hand margin scrolls down the page as users do. This ensures it always remains in view so that getting in contact only requires the click of a button. The controls in the top right hand corner of every page allow users to adjust the size of the text on each web page directly from the site.